With a blend of alchemy and scrying, John Dee and Edward Kelley made up one of the most sensational occult partnerships of all time, but did they really talk to Angels? 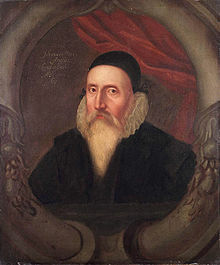 John Dee, in some respects, could be considered an early scientist; he was an expert in navigation, he was invited to lecture on Euclid’s Geometry at the University of Paris in his early twenties, and he was a mathematician. Yet, his search for lost knowledge knew no boundaries, and magic became another pathway for him to thoroughly explore; astrology, alchemy, divination, scrying and summoning were all ways in which Dee sought answers. Dee became a special advisor to Elizabeth I, advising her in astrology and on matters of science; he chose Elizabeth’s coronation date and advised on the voyages of discovery. In short, Dee was a leading expert at the Elizabethan Court and used both science and magic to search for knowledge. It was his partnership with Edward Kelly that he is probably best remembered, and his communion with the Angels that led to his studies into the Enochian language. Dee met Kelley in 1582, and was impressed by Kelley’s scrying ability, employing Kelley to work for him. Kelley however had a rather chequered past, being convicted for forgery, and some modern writers and historians believe he was nothing more than a trickster and an ‘occult charlatan’. Dee was convinced of Kelley’s talents, and what resulted of their partnership was a vivid collection of encounters with Angels and notebooks filled with their language. The partnership took them to Poland, where Dee had a meeting with the Polish King Stefan. Dee and Kelley’s partnership ended a few years after a wife swapping incident in 1587 that was, according to Kelley, ordered by the Angels. Dee returned to England two years later, leaving Kelley on the Continent, where he became an alchemist in the employ of Rudolph II. Rudolph imprisoned Kelley – probably in an attempt to stop him escaping until he had produced gold – and Kelley died after an escape attempt in late 1597/early 1598. Dee died at his home in Mortlake in 1608/1609. Laycock puts forward the idea that Kelley was feeding Dee’s lust for knowledge, the language itself being open to interpretation, but is the language itself a cipher – a code that has yet to be cracked? Dee’s papers were passed onto Elias Ashmole after his death, and Ashmole spent a good deal of time and effort researching the difficult text. He was fascinated by Dee and Kelley’s work, and tried to make contact with the Angels during a succession of séances from 1671 to 1676. We still do not the extent of Ashmole’s work on early Freemasonry, though there are symbols used within Freemasonry that remind us of Dee’s work, such as the use of the pentagram. The legacy of Dee and Kelley’s collaboration was the language of the Angels, but as linguist Donald Laycock suggests in The Complete Enochian Dictionary that there is a possibility that Kelley invented the language, duping Dee, as Kelley did all the scrying work relaying it back to Dee. However, even Laycock puts forward that Kelley may have had genuine visions and the language of the Angels may have been difficult to understand, leading to mistakes. Was Dee the victim of an Elizabethan conman? Dee was passionate about the work and believed that lost knowledge could be gained from these conversations, Dee believing firmly in the work that Kelley did. So, was Dee a victim to a hoax or did they converse with Angels? Donald Laycock, The Complete Enochian Dictionary, (San Francisco: Weiser Books, 2001), p.53.